All things are possible for those who believe. 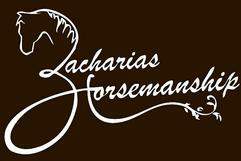 ​Check out our picture gallery to get an impression of Zacharias Horsemanship! Set up an appointment to come and visit or call and talk to the trainers personally about your situation! Sid Zacharias and his 2014 Mustang "Durango the Kid"
At Zacharias Horsemanship, you and your horse's success is our goal! Sid Zacharias is a stellar horseman who has had the opportunity to work with hundreds of horses since he was a small child. He has been training horses for satisfied clients for over 13 years and has had great success both in, and out of the show ring. He has received multiple awards in many different disciplines including; Reining, Trail, Extreme Cowboy Racing, and colt starting competitions. On his journey to achieving the level of excellence he's working toward, Sid came across the American Mustang horse, and discovered how he could work with these horses to produce rewarding partnerships and bring awareness to the Mustang breed. 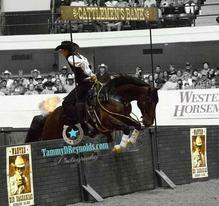 At the age of 19, Sid was named Champion at his first Extreme Mustang Makeover. He went on to compete again next year, where he took the title of Reserve Champion. 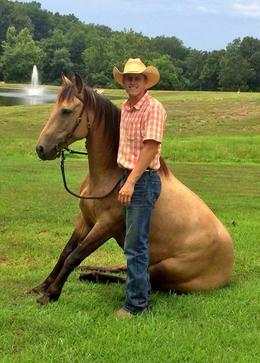 In 2013, he competed in the Mustang Million with two Mustangs, where he made the finals and took home over $21,000. September, 2014, Sid showed up again in Fort Worth, Texas for the Supreme Extreme Mustang Makeover. He won the crowd with his showmanship and entertainment in his freestyle performance, and finished the tough competition as Reserve Champion, also taking home the "Fan Favorite" award. All of the Mustangs trained by Sid have found wonderful homes, and his fans can't wait for more. Sid's humble outlook and extreme dedication to his clients and their horses has brought him far as a recognized trainer among even the best. Zeke Zacharias and his 2013 Mustang "Calico Renegade"
Zeke Zacharias grew up riding horses on a daily basis. 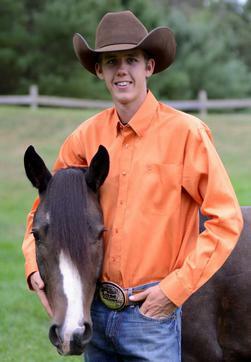 He started training horses for clients at the young age of 13. He has been training horses professionally now for 15 years. During this time Zeke has been able to learn from some of the best horsemen in the industry. Zeke has had success in training and showing Mustangs for the Mustang Makeovers. To Zeke the horse is both a teacher and a friend. One of Zeke’s greatest mentors is reining horse trainer Craig Johnson. He is one of the very best horsemen in the world. Zeke has nothing but respect and admiration for Craig. 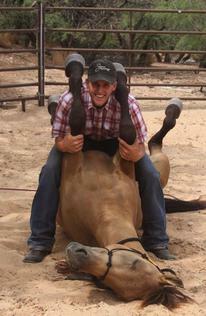 Zeke is always working to improve his horsemanship to be the very best that he can be for his horses and clients. In 2009 Zeke married his beautiful wife Juliane. They now have two boys, Stetson and Sterling. The entire family loves to ride. Zeke feels very blessed to be able to make a living for the ones that he loves, while doing what he loves.